Despite the dawning of a grey day, about 1,500 people gathered to celebrate the Hindu holiday of Holi on UC Berkeley's Lower Sproul Plaza Sunday by painting each other in spatterings of rainbow powder, getting wet and dancing the day away. 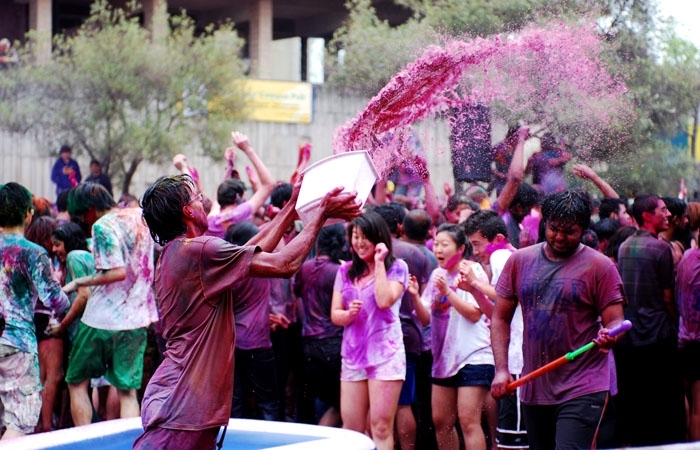 Hundreds of people gathered in Lower Sproul this Sunday to celebrate Holi. A slideshow of images from Holi 2011. Despite the dawning of a grey day, about 1,500 people gathered to celebrate the Hindu holiday of Holi on UC Berkeley's Lower Sproul Plaza Sunday by being painted in spatterings of rainbow powder, getting wet and dancing the day away. In contrast to modern India, where paint is often the coloring agent of choice and friends and family may be targeted by paint-filled water guns, the campus festival was "kind of back to the roots" of Holi in its use of environmentally friendly dyed corn flour, said Indian Students Association co-President Suchitha Sundaram. Students also took care to prevent runoff from flowing into Strawberry Creek, plugging drains and disposing of colored water after the event, which was planned months in advance. Holi itself is a springtime Hindu religious festival with an ambiguous origin story whose details vary from region to region in India, although most agree the festivities celebrate Vishnu-devotee Prahlad's unscathed escape from a bonfire due to his staunch faith in his god. The colors represent setting aside desires to attain enlightenment and societal well-being. "There's no one universal story" though, said Indian Students Association co-President Ash Krishnamurthy, and on campus, Holi was a day for community members of all religious and ethnic stripes to come together and be painted by the same vibrant array of powder. "I really liked it because everyone was all colorful, so you couldn't see what anyone looked like," said freshman Alyssa Lerner. "You felt connected to other people because everyone was covered in these colors, so you couldn't see their skin color or what they actually looked like."